You may have heard of the term "Top Shelf" HandPan (sometimes also referred to as "Top Tier") - it is a phrase used often in such places as the Swap and Sale group found over at Facebook, by those looking to swap pans with those of a similar quality. But what does it mean? 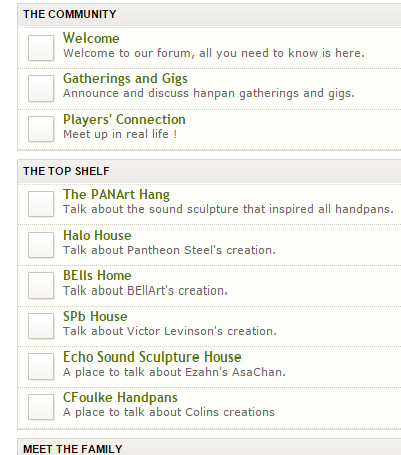 The Top Shelf is primarily a construct of the HandPan.org forum, and consists of a group of instruments that have been deemed by that community to be of the highest quality. And at time of posting, the Top Shelf consists of the work of: PANArt, Pantheon Steel, BEllArt, Victor Levinson, Echo Sound Sculpture, and the recently added CFoulke HandPans. Interestingly, one of the Handpan.org moderators recently gave some insight into what makes for an instrument being classed as being Top Shelf by the forum. Suggesting that significantly increased interest, or ‘groundswell’ in a particular make of pan is a strong factor. As are the opinions and feedback of "top players" and makers, who may have gotten their hands on them, combined with a certain consensus from the hands-on-play of attendees at HandPan gatherings and festivals. Among other factors. With new additions to the Top Shelf being added as appropriate. As a point of note, the Top Shelf system of classification, particularly now that its use often extends outside of the Handpan.org forum itself, has been accused of being biased by some. And deserving, or not, it is true that some long-serving members, or "friends of the forum" have quickly found "houses" there, while those who have been publicly vocal in their condemnation of the system (and/or of the forum itself), such as Panormus, are notable by their absence. And Tzevaot, another make of HandPan that has often found itself at odds with the forums members, have themselves (at time of posting at least) become a banned topic of discussion. In the words of gifted HandPan musician Florian Betz: 'I'm happy, there's not just the "Top Shelf". When I play concerts I often ask the Audience, what Pan I should use for the last song. The result of this "poll" contradicts perception of "Quality" within the community. A good player can create magic on all Handpans'.